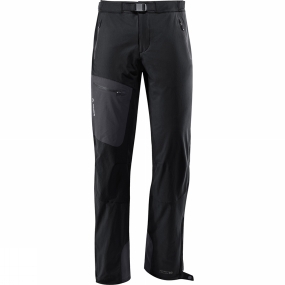 As light as a feather: truly lightweight softshell touring pants made from full-stretch Windproof 80 material for all kinds of fun on the mountains. Ecologically manufactured in accordance with the stringent Bluesign standard. With side ventilation zips and sonic-welded leg pocket. This product is manufactured with Eco Finish and is eco-friendly, water repellent and fluorocarbon-free (PFC-free).